So right by where I park my car theres this boat trailer, and as I was washing the car I accidentally sprayed some water on this spider web that was on the trailer. I really didn’t think anything of it until a few seconds later I see this black thing crawl out with 8 legs!! 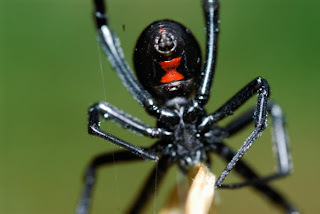 My jaw just about fell open when I saw it and realized that it was a MASSIVE Black Widow, this thing is huge!! Of course I ran in the house and grabbed my gear to try and get some shots. 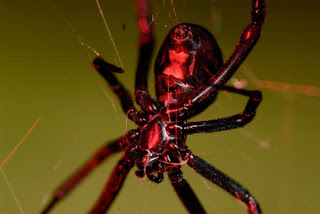 To my great frustration I soon found out that this thing is super shy, I would spray the web with water as that seemed to be the only thing that would shake the web in a “natural” way making it thing that it was a meal. It would come out and I would compose my shot and focus in on it, but as soon as I focused on it it would go back to its hiding place. This went on for about an hour until I finally got tired, later when it was night I went out to do some shooting. When I returned home I saw it there out in the open and so I went to get some shots, but as soon as the flash went off it was gone. Oh well I will continue my attempts and see if I can get at least one shot that I am happy with. In the mean time here are the ones that I have so far, they are not good at all but still fun. Enjoy! !